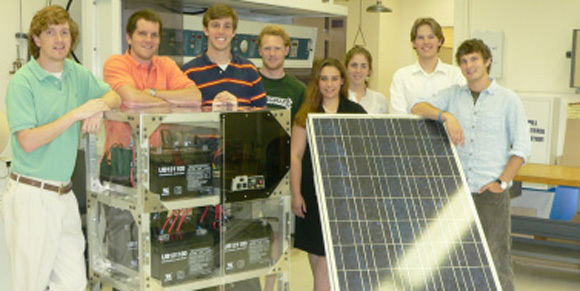 The Gendell Center for Engineering, Energy, and the Environment is the central focus of an Energy and Environmental Systems Engineering initiative which prepares students to tackle significant societal problems related to environmental quality, and sustainable energy and security. Elevate the technical knowledge of students across Duke, in the Trinity College of Arts & Sciences, the Pratt School of Engineering and the Nicholas School for the Environment and Earth sciences. Forbe's 30-Under-30 notables Karim Khalil and Scott Martin cited their experiences in Duke's Energy and Environment certificate program – "At Duke, I was exposed to energy from all different angles, not just the technical side,” Khalil said. A Gendell Center student team won “Most Innovative Design” for their design of a water treatment system powered purely by wind to supply the daily needs of a village of 100 without the use of electricity. Students interested in energy and the environment can also pursue NAE Grand Challenge Scholar recognition.